Marita Conlon McKenna is one of Ireland’s best loved authors and her books are enjoyed by readers across the world. Marita grew up in Dublin, with much of her childhood spent in a house overlooking the sea in Greystones, Co Wicklow. Passionate about Irish history Marita’s first book Under the Hawthorn Tree is set during The Great Irish Famine. 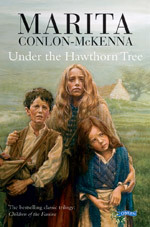 The book was inspired by the discovery of a famine grave with the skeletons of three children buried under a hawthorn tree. Published in 1990, the book became an immediate bestseller with rights sold across the world. It went on to win the prestigious International Reading Association award in the U.S., ‘The Osterreichischer Kinder und Jungendbuchpreis’ in Austria , The Reading Association of Ireland Award and was filmed by Young Filmmakers Ireland in association with RTE and Channel 4. The book has become a classic and is used by schools both in Ireland and overseas. 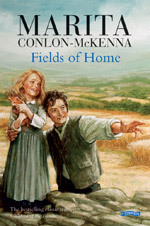 It is part of the best-selling ‘The Children of the Famine’ series which follows The O’Driscoll family, who are caught up in the most turbulent times in Irish history. 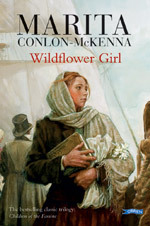 Wildflower Girl follows the emigration of Peggy to America and in Fields of Home the family’s struggle for land in Ireland and America. Two of Ireland’s foremost artists have done the cover and art work for the series, Donald Teskey and P.J. Lynch. The hawthorn tree… ‘the fairy tree’ is precious to Marita. She loves to collect hawthorns… jewellery, art, sketches, pottery, ceramics, photographic and the one here on her website is by artist Don Conroy. Her other children’s books include The Blue Horse winner of ‘The Bisto Book of the Year Award’, Safe Harbour, In Deep Dark Wood and Love Lucie. Marita also writes women’s fiction and her novels regularly top the best seller list and have been widely translated. Drawn to write about the women and girls who were sent to work and live in Ireland’s infamous Magdalen Laundries, Marita’s first adult novel The Magdalen, was hugely successful when it was published in 1999. The book which explores the lives of the Magdalen Women is one that still touches readers and raises many issues. Her other books include The Stone House, The Matchmaker, Mother of the Bride, Three Women and The Rose Garden (published June 2013). Marita is a former chairperson of Irish Pen, the organisation for writers. She has been involved actively for many years promoting arts and literature and the position of Irish writers. On Bloomsday 16th June 2012 Marita was one of the writers that helped break The Guinness World Record for The Most Authors Reading Consecutively From Their Own Work. Pretty amazing as she never considered herself a record–breaker! She loves to meet readers and enjoys talking at book festivals, libraries and schools where she encourages everyone to read and to write. As a writer Marita is always curious…enjoys exploring Ireland’s history and writes about issues that interest her. Her books touch hearts and minds and are filled with strong storytelling, warm characters and explore family relationships and landscapes. Marita lives in Dublin and is married to James and has four grown-up children. Here’s a link to Marita’s photo gallery.